Liczba stron: 168 Jest to ujednolicona liczba stron, która ułatwi Ci porównanie długości książek. Każda strona Legimi to 200 słów. One of the great works of Western literature, Voltaire's Candide is a picaresque tale with profound philosophical underpinnings. Its plot, which sees the eponymous hero stoically endure one calamity after another, elegantly delineates Voltaire's belief that no matter what may befall us, 'all is for the best in this best of all possible worlds.' Revised version of the Smollett translation. Presented in modern English spelling and punctuation. Published by The Rococo Press, 2018. © Copyright 2018 by The Rococo Press. This book or any portion thereof may not be reproduced or used in any manner whatsoever without the express written permission of the publisher except for the use of brief quotations in a book review or scholarly journal. All rights reserved. The Baron was one of the most powerful lords in Westphalia, for his castle had not only a gate, but windows. His great hall, even, was hung with tapestry. All the dogs of his farmyards formed a pack of hounds at need; his grooms were his huntsmen; and the curate of the village was his grand almoner. They called him “My Lord,” and laughed at all his stories. The Baron’s lady weighed about three hundred and fifty pounds, and was therefore a person of great consideration, and she did the honors of the house with a dignity that commanded still greater respect. Her daughter Cunegonde was seventeen years of age, fresh-colored, comely, plump, and desirable. The Baron’s son seemed to be in every respect worthy of his father. The Preceptor Pangloss was the oracle of the family, and little Candide heard his lessons with all the good faith of his age and character. One day Cunegonde, while walking near the castle, in a little wood which they called a park, saw between the bushes, Dr. Pangloss giving a lesson in experimental natural philosophy to her mother’s chambermaid, a little brown wench, very pretty and very docile. As Miss Cunegonde had a great disposition for the sciences, she breathlessly observed the repeated experiments of which she was a witness; she clearly perceived the force of the Doctor’s reasons, the effects, and the causes; she turned back greatly flurried, quite pensive, and filled with the desire to be learned; dreaming that she might well be a sufficient reason for young Candide, and he for her. She met Candide on reaching the castle and blushed; Candide blushed also; she wished him good morrow in a faltering tone, and Candide spoke to her without knowing what he said. The next day after dinner, as they went from table, Cunegonde and Candide found themselves behind a screen; Cunegonde let fall her handkerchief, Candide picked it up, she took him innocently by the hand, the youth as innocently kissed the young lady’s hand with particular vivacity, sensibility, and grace; their lips met, their eyes sparkled, their knees trembled, their hands strayed. Baron Thunder-ten-Tronckh passed near the screen and beholding this cause and effect chased Candide from the castle with great kicks on the backside; Cunegonde fainted away; she was boxed on the ears by the Baroness, as soon as she came to herself; and all was consternation in this most magnificent and most agreeable of all possible castles. CANDIDE, DRIVEN FROM terrestrial paradise, walked a long while without knowing where, weeping, raising his eyes to heaven, turning them often towards the most magnificent of castles which imprisoned the purest of noble young ladies. He lay down to sleep without supper, in the middle of a field between two furrows. The snow fell in large flakes. Next day Candide, all benumbed, dragged himself towards the neighboring town which was called Waldberghofftrarbk-dikdorff, having no money, dying of hunger and fatigue, he stopped sorrowfully at the door of an inn. Two men dressed in blue observed him. They went up to Candide and very civilly invited him to dinner. “Yes, sir, that is my height,” answered he, making a low bow. They begged of him to accept a few crowns. He took them, and wished to give them his note; they refused; they seated themselves at table. “Oh! very willingly, gentlemen,” and he drank. Instantly they fettered him, and carried him away to the regiment. There he was made to wheel about to the right, and to the left, to draw his rammer, to return his rammer, to present, to fire, to march, and they gave him thirty blows with a cudgel. The next day he did his exercise a little less badly, and he received but twenty blows. The day following they gave him only ten, and he was regarded by his comrades as a prodigy. 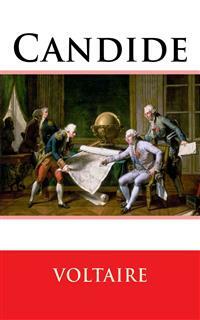 Candide, all stupefied, could not yet very well realize how he was a hero. He resolved one fine day in spring to go for a walk, marching straight before him, believing that it was a privilege of the human as well as of the animal species to make use of their legs as they pleased. He had advanced two leagues when he was overtaken by four others, heroes of six feet, who bound him and carried him to a dungeon. He was asked which he would like the best, to be whipped six-and-thirty times through all the regiment, or to receive at once twelve balls of lead in his brain. He vainly said that human will is free, and that he chose neither the one nor the other. He was forced to make a choice; he determined, in virtue of that gift of God called liberty, to run the gauntlet six-and-thirty times. He bore this twice. The regiment was composed of two thousand men; that composed for him four thousand strokes, which laid bare all his muscles and nerves, from the nape of his neck quite down to his rump. As they were going to proceed to a third whipping, Candide, able to bear no more, begged as a favor that they would be so good as to shoot him. He obtained this favor; they bandaged his eyes, and bade him kneel down. The King of the Bulgarians passed at this moment and ascertained the nature of the crime. As he had great talent, he understood from all that he learnt of Candide that he was a young metaphysician, extremely ignorant of the things of this world, and he accorded him his pardon with a clemency which will bring him praise in all the journals, and throughout all ages. An able surgeon cured Candide in three weeks by means of emollients taught by Dioscorides. He had already a little skin, and was able to march when the King of the Bulgarians gave battle to the King of the Abares. THERE WAS NEVER ANYTHING so gallant, so spruce, so brilliant, and so well disposed as the two armies. Trumpets, fifes, hautboys, drums, and cannon made music such as Hell itself had never heard. The cannons first of all laid flat about six thousand men on each side; the muskets swept away from this best of worlds nine or ten thousand ruffians who infested its surface. The bayonet was also a sufficient reason for the death of several thousands. The whole might amount to thirty thousand souls. Candide, who trembled like a philosopher, hid himself as well as he could during this heroic butchery. At length, while the two kings were causing Te Deum to be sung each in his own camp, Candide resolved to go and reason elsewhere on effects and causes. He passed over heaps of dead and dying, and first reached a neighboring village; it was in cinders, it was an Abare village which the Bulgarians had burnt according to the laws of war. Here, old men covered with wounds, beheld their wives, hugging their children to their bloody breasts, massacred before their faces; there, their daughters, disemboweled and breathing their last after having satisfied the natural wants of Bulgarian heroes; while others, half burnt in the flames, begged to be dispatched. The earth was strewed with brains, arms, and legs. Candide fled quickly to another village; it belonged to the Bulgarians; and the Abarian heroes had treated it in the same way. Candide, walking always over palpitating limbs or across ruins, arrived at last beyond the seat of war, with a few provisions in his knapsack, and Miss Cunegonde always in his heart. His provisions failed him when he arrived in Holland; but having heard that everybody was rich in that country, and that they were Christians, he did not doubt but he should meet with the same treatment from them as he had met with in the Baron’s castle, before Miss Cunegonde’s bright eyes were the cause of his expulsion thence. He asked alms of several grave-looking people, who all answered him, that if he continued to follow this trade they would confine him to the house of correction, where he should be taught to get a living. The orator’s wife, putting her head out of the window, and spying a man that doubted whether the Pope was Anti-Christ, poured over him a full... Oh, heavens! to what excess does religious zeal carry the ladies. The next day, as he took a walk, he met a beggar all covered with scabs, his eyes diseased, the end of his nose eaten away, his mouth distorted, his teeth black, choking in his throat, tormented with a violent cough, and spitting out a tooth at each effort. CANDIDE, YET MORE MOVED with compassion than with horror, gave to this shocking beggar the two florins which he had received from the honest Anabaptist James. The specter looked at him very earnestly, dropped a few tears, and fell upon his neck. Candide recoiled in disgust. “I am so weak that I cannot stand,” said Pangloss. “She is dead,” replied the other. Candide fainted at this word; his friend recalled his senses with a little bad vinegar which he found by chance in the stable. Candide reopened his eyes. At this discourse Candide fainted again; but coming to himself, and having said all that it became him to say, inquired into the cause and effect, as well as into the sufficient reason that had reduced Pangloss to so miserable a plight.